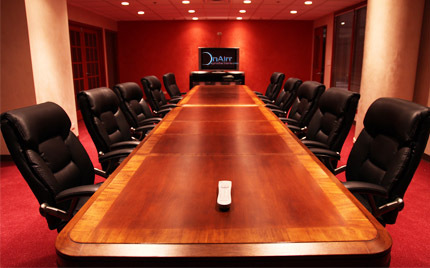 The Conference Room provides a professional setting within the studio with comfortable seating for 12. We offer telephones and Wi-Fi for conference needs as well as 55’ plasma TV compatible with any HD, Blu-Ray, or VTR deck for the perfect presentation. This is also a great space for housing staff that need to communicate with clients long distance during live feeds from our studio!